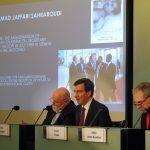 On Monday, February 4th, Alejo Vidal Quadras, the former Vice-President of the European Parliament, Louis Freeh, the former director of the FBI, Farzin Hashemi of the National Council of Resistance of Iran (NCRI), Giulio Terzi, the former foreign minister of Italy, Yves Bonnet, the former director of France’s DST, and Claude Moniquet, a counter-terrorism and Middle East specialist, attended the International Conference in Brussels to discuss the Iranian threat. Vidal Quadras opened the conference with a brief on the Iranian regime’s terrorist activities in Europe and the US, particularly the recent terrorist activities targeting the MEK. He described how those accused of plotting terrorist acts abroad have close ties to Iranian president Hassan Rouhani and regularly accompanied the Iranian Foreign Minister Javad Zarif to meetings. Freeh drew parallels between the most recent spate of Iranian-sponsored terror attacks on foreign soil and previous attacks that took place while he was head of the FBI. Freeh concluded, “the Iranian regime cannot be trusted,” adding, “the regime has been doing the same thing for the past 25 years.” “Terrorism is not a pattern of behavior but it is institutionalized. Appeasement of the regime not only conveys a sense of weakness, but it conveys to the adversary to continue to do what it does and the business goes on,” Freeh asserted. For Freeh, the EU needs to modify its position. Continuing down the road of appeasement will not help combat Iranian terrorism. It will allow it to continue unchecked. “The only way to deal with this regime is clear, firm force and applied sanctions,” he said. 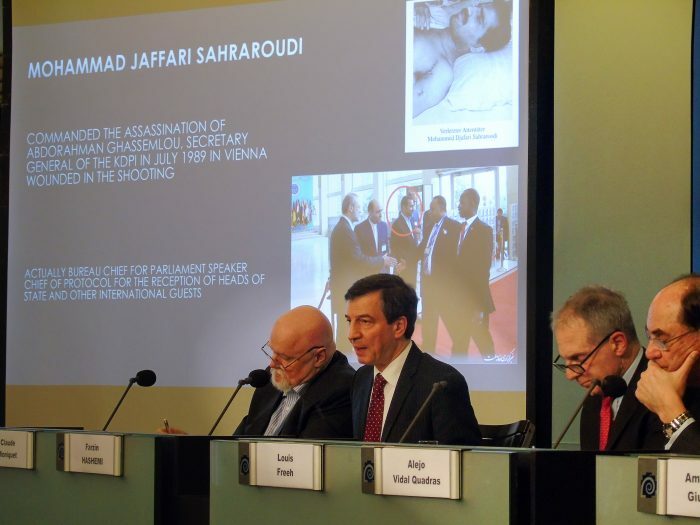 To support Freeh’s assessment, the NCRI’s Farzin Hashemi described the findings of an investigation carried out by the NCRI and the People’s Mujahedin Organisation of Iran (MEK). Hashemi revealed that Reza Amiri Moghaddam was responsible for the planning and execution of the foiled terror attack in Paris. He coordinated the operation, which involved using a car laden with explosives to attack members of the MEK and their allies at the opposition group’s annual Grand Gathering event, from Vienna with the regime’s diplomat, Assadollah Assadi. Moghaddam also represented the Iranian regime during the Iranian nuclear deal negotiations. “The EU has been negotiating with individuals who have been personally involved in acts of terrorism and planning in terrorism,” he said. Additionally, the recently expelled ambassador to Albania, Gholam Hossein Mohammadnia was also a member of the regime’s JCPOA negotiating team. “All the regime’s officials are involved in terrorism. They cannot be interlocutors to the European governments. It is time for the EU to impose sanctions on the entire MOIS (Ministry of Intelligence and Security) and IRGC,” Hashemi concluded. Alejo Vidal Quadras then handed the former Foreign Minister of Italy, Giulio Terzi, the floor. Terzi introduced the regime’s cyber threat and charted its subversive activities online. He accused Iran of using social media to subvert Western democracy. “Accounts under false names” are emerging from Iran, he said. “Special attention is needed for counteracting the cyber threat from Iran,” Terzi asserted. All of the speakers at the conference endorsed similar methods for dealing with the regime’s threat. “We must close down the embassies of the Iranian regime that violate the laws of the countries that host them,” Yves Bonnet, the former director of France’s DST, said. He also endorsed international recognition of the NCRI and the MEK as a viable democratic alternative to regime rule. Counter-terrorism and Middle East specialist, Claude Moniquet echoed these views and called for tougher sanctions against the MOIS and IRGC. “We have the power to use our authority to obtain and impose verifiable sanctions on the Iranian regime immediately for its terrorist activities on European soil,” he said.